A week of climbing on some of the best rocks the east has to offer! Our rock climbing trip has the best locations, instructors and itinerary. This trip is designed for kids that want to improve their climbing skills and enjoy a week full of climbing and camping on awesome spots. 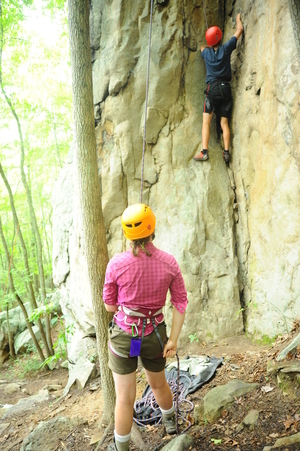 This specialty trip will give participants a full-immersion rock climbing experience. To that end, we have refined our programs over the years to have the perfect mix of instruction and climbing time on the rock every day, mixed in with some fun evening activities. Our regular trip focus on the climber with little or previous experience. From kids who have climbed only on teams in gyms to those who have climbed outdoors but have only done sport climbing, we have campers who come from all over the country to experience rock climbing in our different locations. Campers learn all aspects of climbing and have a host of new adventures! This trip is a one o one climbing trip where you will meet lifelong friends and climb amazing rock in a wonderful setting. Most gear is provided for the Classic Adventure trips. We provide backpacking, camping, and activity gear. You need to provide clothes and hygiene items for the trips. If you have your own gear you are welcome to bring what you have. You can check out our Packing List to see what gear or clothes you might need to bring for the trip. Campers will start Base Camp,where they will go through a thorough introduction to climbing and belaying, as well as basic outdoor and camping skills. They'll also get to know their fellow climbers on the teambuilding course and establish goals for their trip. Campers will learn the different types of equipment. they will have an understanding of equipment use for traditional climbing as well as sport climbing. they will learn different types and uses of ropes and the basic principles of use and equipment safety. campers will learn the different techniques for the different levels and type of rock. for example, they will learn how to pass an overhang or how to climb a crack plus learn how to use and save energy while using the right technique for other fun types of challenges the rock has. besides that they will learn a bunch of great climbing knots and learn how to tie themselves and be safe. Belaying is a process used in climbing that typically uses a rope system to protect a climber in the event of a fall. The process of belaying involves equipment unique to its function, campers will learn how to belay with the different equipment and climb safely by checking gear and have an assertive communication with their climbing partners. Participants will leave this trip as more confident climbers and have a sense of independence and accomplishment that frequently compels them to return year after year to refine their skills and enjoy climbing in the beautiful locations that surround us.